From 7 to 12 June 2017, a devastating fire destroyed huge tracts of land and infrastructure in and around Knysna and Plettenberg Bay, burning down formal and informal housing, and claiming seven lives. 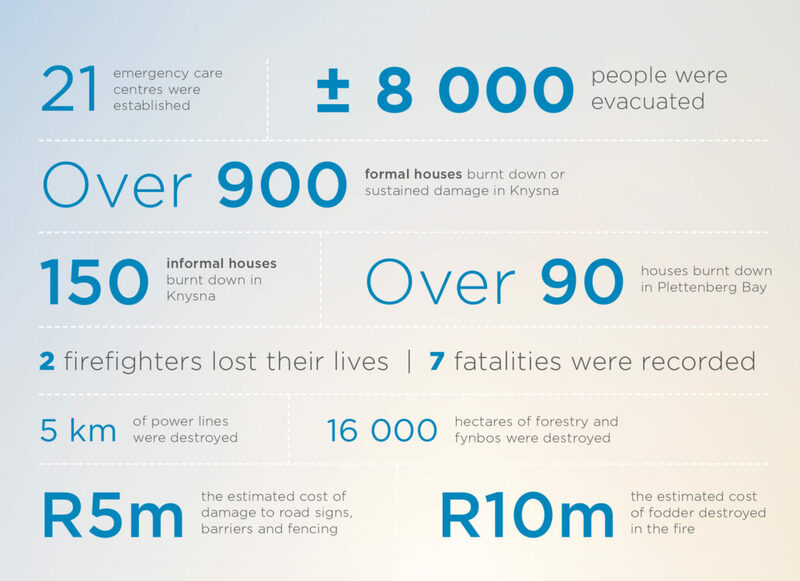 The Knysna Inferno is regarded as one of the largest fire disasters South Africa has ever experienced. The fire was stoked by gale force winds, paired with warm mountain wind conditions, instead of the anticipated rainfall across the region. Fires raged on two fronts and could not be contained. The blaze was so hot that buildings and trees 300 m ahead of the inferno began burning. At one stage, the fire is reported to have moved one kilometre every 10 minutes. Communications were affected and water supplies ran dangerously low. More than 1 100 formal and informal homes were destroyed and about 8 000 people were evacuated and provided with temporary accommodation. 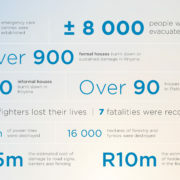 National government subsequently declared a provincial fire disaster in the Knysna and Plettenberg Bay areas.